So in inquiring about wire line fishing, I realize that many guys utilize wire dipsys for kings but how many utilize suspended wire with 16oz. or greater lead balls? Just curious what you find is the major difference using the lead balls versus the dipsys...besides having them pull directionally of course and how you go about determining where roughly in the water column the presentation is. I was thinking of maybe picking up a few 16oz lead balls and giving it a shot this summer. I have some but never seem to use them since I got my riggers. Lead balls are great for bouncing bottom but I prefer dipsys. Most who run them run one down the shoot. The Wire Dipsy is one of the best presentations year in and year out. We have won many Tournaments with the Wire Dipsys out producing everything else. Also the biggest Kings seen to like them. Flasher Fly and also J Plugs have been the ticket with us. I agree with HTR. The lead balls are good for bouncing bottom but they don't seem to produce. Some guys swear by the Lead ball down the chute with a meat rig. I have a device that I bought at the Rosemont show made by Fishtech that is about the size of a car opener black thing that opens the door or sets the alarm. You attach above or near the dipsy or Lead ball and when you bring it in it tells you the exact depth you are trolling at and the Temp at the ball and also the temp every 5ft up to the surface. You actually see where the temperature break is like a depth raider. It is a neat gadget. I tried to get one of those but they seemed to stop making them. Fishhawk just came out with the same thing this year. Great alternative to a temp probe. Wow your right. Fish Hawk makes these for 149.99. I think I paid 69.99. Fishtech stopped making the one I have like you said. Other people that have the one I have say they break very easily. I have been very careful with mine. So in your opinion guys I should stick with the wire dipsys and forget the wire and lead ball? I have a talora roller rod with wire I use with a dipsey. Smoke dodger, meat head, and wire have caught the biggest kings on my boat. I have only used balls for lakers. I've used both with good success. I have kind of drifted away from the suspended wire the last few years, although I couldn't tell you why. Too many things I want to run and not enough rods in the water, I guess. Because it drops straight back, I would usually pull one of the corner riggers and put the wire in that slot. I never run anything down the chute, but especially not wire. Every hooked fish eventually ends up directly behind the boat and I don't want the wire tangling with another line and cutting off a fish. hit a white 0 dodger & white fly on a suspended wire rig in 65' of water. The line was out approx 100' on the linecounter, before the fish ran it up to 600'+. That same rig had taken an 18 lb king the day before, too. And, yes, this was a couple years ago. I have run the suspended wire with as little as 50' of line out and as much as 250' of line out, depending on how deep the water is and where I want the bait. It takes some experimenting, but I would definitely consider it worthwhile to try it out. Good Luck! I have been thinking about adding 1 or 2 wire riggs to our arsenal for next year I was thinking about the okuma combo's available from brett's place on the bay . I was wondering if anyone had used these and if so what they thought ? Summer time after the morning bite when the sun comes up wire ball 1-5 ft off the bottom 40-90 fow large silver dodger, green krinkle fly 34in lead. This is for big kings not for lakers just keep it up off the bottom. When you say "large silver dodger", are you talking the chrome/prism tape dodger or the silver glow (aka trash can, aka smoke) dodger? I assume large means 8" (size 0), correct? Finally, how do you measure your fly leaders (to the nose of the fly, or to the bottom of the skirt)? Thanks in advance. alphafladge, I have one of the Okuma Blue Diamond roller rods and I like it alot. I also had a couple Okuma Magda reels in the past and lets just say I was not impressed. They are no longer in the arsenal.I don't have enough experience with other Okuma reels to offer an opinion. Good Luck! That is a size O metal chrome with silver prism tape dodger and the extra long leader is measured from the nose. That rig has taken biggest fish of the tournament 4 times. If the lake has a good thermalcline set up and the kings disapear after early am bite start where the temp break and bottom meet and work out deeper. You can also pick up cohos and bows down there. I don't stack the bottom with more rods I'll keep it all alone. I believe the new version is a swr down deep for similar results. Thanks, Capt Mike. I am definitely going to try that. Is it spring yet? When you say a suspened ball what does the rig look like ? We have a few set ups but i think these realease the ball when a fish hits . Do you just hook the ball to the wire then use a snubber or something between the ball and the lure ? It basically looks like an over-sized 3-way river rig. I use a plastic trolling rudder as the 3-way, but you don't have to. The 1# ball hangs from the rudder or a snap-swivel. I use a snubber between the rudder and the 6' leader to the bait. Snubbers can be a matter of personal preference. The weight is NOT released. I'm not sure, but I believe releasing lead weights is a no-no these days. It used to be very common, but not any more. The term "suspended" relates to the fact that you are running the rig suspended in the water column, rather than bouncing bottom with it (and as opposed to "suspending" the ball from the rig). Hope that helps. Good Luck! Sounds like a different thread in the making is this something to run off of a wire line as well ? Too much stuff out there been looking at cowbell set ups and trolling rudders all evening just boggles the mind sometimes the different set ups people run and thats before you even consider colors and different sizes !! We definitely use 1# and 1/2 # setups on power pro line with big 3 way swivels on a line counter reel. I do use a snubber after the 3 way with a 5' leader to the lure. Any lure will work. It can be run at any depth, not just on the bottom. This has produced well in the first part of summer after the coho disappear. It seems that for the past few years, the fish have gotten extremely spooky in the early summer--not so much once late July rolls around. We will fire 2 or more riggers and put a couple of these rigs in their place and SOMETIMES that makes a big difference in the production. It is weird, but after making this switch, other rods become more active, too. I used a bouncing ball early in the summer to put some of my bigest lakers in the boat. I think the ball bouncing on the bottom provides some attractiion that cant be matched with a wire dipsy. I took a few kings in July doing the same thing with my riggers balls. The only problem I have had is fouling up hooks with moss and mussels. I only fish south of the city, so there arent many grabby bottom features to deal with. 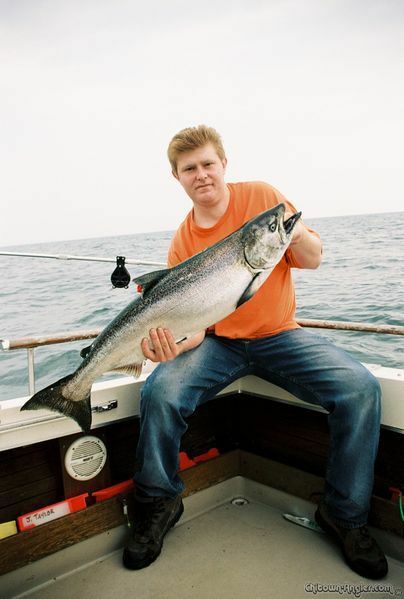 Chitown-Angler was started on February 10, 2003 and has received 207380735 page views in total since that date.